Eleven cars sold for over a million dollar at the 2015 Gooding Scottsdale classic car sale. The top result was a 1959 Ferrari 250 GT LWB California Spider that achieved $7,700,000. The three most-expensive cars were Ferraris followed by a Porsche racing car. 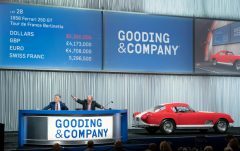 Of the four Mercedes Benz 300 SLs on offer, only one found a buyer despite all achieving highest bids exceeding a million dollar. Five of the top-ten results, including the three highest prices paid, at the Gooding 2015 Scottsdale classic car auction were for Ferraris. 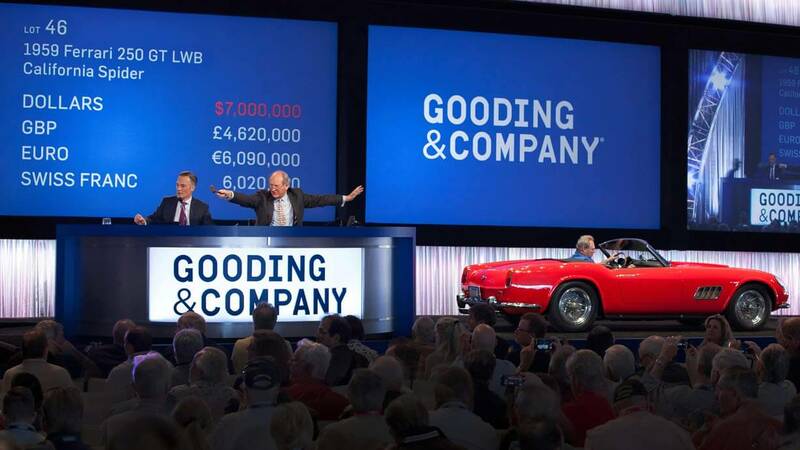 The top result at the Gooding 2015 Scottsdale auction was $7,700,000 for a 1959 Ferrari 250 GT LWB California Spider. The hammer came down at $7 million – a million below the pre-auction estimate of $8-10 million. This was the third highest price of all classic car auctions in Scottsdale and Arizona in January 2015, after new auction week record were set at Bonhams and a day later at RM Auctions. The 1959 Ferrari 250 GT LWB California Spider was one of only 50 long-wheel base California Spiders ever produced. It is in a magnificently unrestored condition and believed to be the only Ferrari 250 California Spider still with its original upholstery. The car had a single owner since 1969. The second highest result at the Gooding 2015 Scottsdale classic car sale was $4,070,000 for a 1962 Ferrari 400 Superamerica Series I Coupe Aerodinamico with coachwork by Pininfarina. Ferrari built only 35 of the 400 Superamericas with this example one of only seven built with covered headlights on a short-wheel base chassis. The car is in a faithfully restored condition in its original white over black color scheme. A 1968 Ferrari 330 GTS with coachwork by Pininfarina achieved $2,420,000 at the 2015 Gooding Scottsdale sale. It is one of 99 cars ever produced. A 1963 Ferrari 250 GT Lusso achieved $1,925,000 as the fifth highest price paid at the Gooding 2015 Scottsdale classic car auction. It was the only of the million-dollar cars to have sold for above the pre-auction estimate ($1.6-1.8 million). The fifth Ferrari on the top-ten list was a 1965 Ferrari 275 GTS selling for $1,595,000. It is one of only 200 ever built and had the same owner since 1970. The 1990 Formula 1 Ferrari 641/2 driven by Nigel Mansell to victory in the 1990 Portuguese Grand Prix just missed out on a million-dollar result when it achieved $990,000. The third-highest bid at the two-day Gooding 2015 Scottsdale classic car sale was $2.9 million for a 1967 Ferrari 275 GTB/4 but failed to clear the reserve margin. The pre-auction estimate was $3,250,000 to $3,750,000. A 1966 Porsche 906 Carrera 6 achieved $1,980,000 at the Gooding sale as the best result for a Porsche at the 2015 Scottsdale auction week. This Porsche was raced by Racing Team Holland, which explains the orange livery, to victories and several podium finishes in the 1966 and 1967 seasons. A 1988 Porsche 959 Sport – a classic poster car from the 1980s – achieved a high $1,705,000 result at the Gooding 2015 Scottsdale auction. It is one of only 29 Sport examples ever built and had a rare upgrade to Factory Stage II specification. A 1973 Porsche 911 Carrera 2.7 RSH achieved a highest bid of $1,050,000 but failed to clear the reserve margin (est. $1.25-1.5 million). Of the four Mercedes Benz 300 SLs on offer, only the 1960 Mercedes Benz 300 SL Roadster found a buyer and at an impressive $1,567,000. Although all attracted bids of well over a million dollar, the other three failed to clear the reserve margins. With Bonhams and RM Auctions each offering three 300 SLs during the Scottsdale week, it seems investors have caught on that these beautiful cars are too common for standard models to demand prices of $1.5 million. A 1959 BMW 507 Series II achieved $1,815,000. BMW produced only 252 of these roadsters making it far more rare than the famous Mercedes Benz 300 SLs from the same period. A 1970 Lamborghini Miura P400 S sold for $1,155,000. The car was the 463rd of around 765 Miuras ever produced but one of only 140 Miura S cars. It was originally finished in Fly Yellow but is currently in the more popular Miura Green. A 1964 Shelby 289 Cobra also achieved $1,155,000 at the Gooding Scottsdale 2015 sale. It is a highly original and unrestored Cobra in its original red over black color scheme. A further unrestored, “barn-find” 1964 Shelby 289 Cobra sold for $979,000.